The Dark (1979, dir: John 'Bud' Cardos; scp: Stanford Whitmore; cast: William Devane, Cathy Lee Crosby, Richard Jaeckel, Biff Elliot, Warren J. Kemmerling, Keenan Wynn, Jeffrey Reese, Jay Lawrence, Casey Kasem, Russ Marin, Vivian Blaine, Vernon Washington, John Bloom, Angelo Rossitto, Philip Michael Thomas; aka The Mutilator). Here's a film that borrows elements from not one, but two distinct decades of horror: 1950s bug-eyed monster movies, and 1970s supernatural TV horror. I know no term for that 1970s style of supernatural TV horror, but you know it if you've seen it. Shows like Ghost Story/Circle of Fear, Kolchak: The Night Stalker, Night Gallery, The Darkroom. TV movies like Horror at 37,000 Feet (1972), Don't Be Afraid of the Dark (1973), and The Initiation of Sarah (1978). Theatrical films like The Evil (1978, aka Cry Demon, House of Evil), Burnt Offerings (1976), and The Sentinel (1977) share some of that sensibility. Many 1970s supernatural horror productions feature that same canned music; an eerie harpsichord piece and/or a trilling flute noise. This somber silliness evokes those 1950s BEM movies in which some narrator or scientist delivers an overly-long bit of pseudo-science, spoken with the stern seriousness of a high school biology film strip. Although, it may also have been inspired by Star Wars's screen scroll, that film released only two years earlier. And to assure we're scared, characters oblige us by wandering about dark deserted hallways, parking lots, streets, nervously glancing about, sometimes killed, sometimes not. 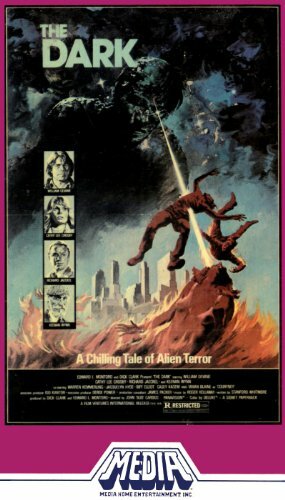 Yet despite the title, this is not a film about the dark, but about a killer alien. While the atmospheric style is 1970s, the monster story is 1950s, with a shamelessly cheesy alien. Its hands resemble Lon Chaney's werewolf, hairy with long dark fingernails. It hurriedly stumbles after our heroes in what appears to be (in silhouette) Frankenstein monster boots. Its red cat-like eyes shoot raygun beams that toss people across a room before causing them to explode without a trace. The dead woman was the daughter of horror novelist Roy Warner (William Devane). Devane has made a career out of playing clean-cut authority figures, but here he is scruffy and long-haired, as befits a horror novelist. Naturally, Roy Warner has also done prison for manslaughter, his novels are "nothing but blood and gore," and he lives in a pricey Hollywood Hills house. Roy Warner is one of The Dark's more original characters, as the film is a parade of stereotypes. We have two cops assigned to catch the killer. One's a clean-cut straight-arrow (Richard Jaeckel), the other's a pudgy slob (Biff Elliot) forever dripping donut filling. This allows for the usual comic relief, as when Jaeckel tells Elliot to "buy a bib." The Dark has the usual Police Captain (Warren J. Kemmerling) who gets heat from the mayor, hates the press, and wants to "keep a tight lid" on events. You've met him in many a Kolchak episode. When one cop suggests the killer is a "zombie," the Captain explodes: "Zombie! Mangler! I don't want to here any of that!" The Dark also has a bizarre gypsy fortune teller, a midget newspaper vendor (more comic relief), and jive-talking blacks (one of them wearing a puffy denim pimp cap). Philip Michael Thomas (Miami Vice) has a bit part as an angry young black man. In fact, the Internet Movie Database credits Thomas as "Angry Young Black Man." This is noteworthy, because the film credits refer to Thomas's character as: "Corn Rows." Well, his hair IS in corn rows. Cathy Lee Crosby (That's Incredible) plays Zoe, a crusading TV reporter. And yes, although hired for her looks, she's tired of covering fluff, and wants to do hard news in "the big league." Zoe's supposed to be bright, but she's not very. At least not as written by Stanford Whitmore. Zoe pontificates that it's "ironic" that the daughter of a horror novelist (who trades in gore) was killed in gory fashion. Warner accuses Zoe of implying that it was "poetic justice." Zoe insists she meant ironic, but that's because she's illiterate. Irony requires incongruity, so it would have been ironic if Warner's books had promoted peace. I don't think screenwriter Whitmore intended Zoe to be illiterate, but she is. Zoe's illiteracy also causes her to be self-contradictory. She accuses detective Jaeckel of not doing enough to find the killer. Moments later, she switches and accuses him of going too far ("Thirty-two caliber justice?" she accuses). One senses that Whitmore was writing cool clichés, unaware when his lines were contradictory. Zoe is supposed to be smart and idealistic, yet if one listens, she sounds illiterate and ego-driven. But since Crosby looks good, we're not really listening to her Zoe. Good-looking Zoe (Cathy Lee Crosby) interviews a protester upset over the cop's inability to find "the mangler." Occasionally, their heads are ripped off, or shot into nothingness by the alien's red raygun eye beams (I call them eye beams, but sometimes they look more like mini-photon torpedoes). Curiously, when one jive-talking black guy goes in search of his prostitute, he gets shot with those eye beams and explodes into nothingness. But later, it's reported that he was decapitated. Then, when another character burns and disappears into nothingness, the remaining characters marvel that there appears to be nothing left. As Warner and Zoe repeat to each other: "Weird." Eventually, clues are found and the alien is cornered. At which point, the heroes run away. The cops arrive, and there's much shooting of guns and eye beams. The alien snatches Zoe and, maintaining proper 1950s BEM standards, for the first time in the film he does not instantly kill his victim. Seems he just wants to hold Zoe, maybe carry her off somewhere. This gives her time to scream and be rescued. The Dark was produced by Film Ventures International, a prolific horror film company during the rise of video. It eventually went bankrupt, the fate of many indie startups. Much later, The Dark was re-released on video as The Mutilator, making all that whispering of "Theeeee da-a-a-a-a-a-ark" all the more nonsensical. (Not to be confused with the 1985 slasher film, The Mutilator, aka Fall Break). The Dark is hardly original or great. And despite its comic relief or cheesy clichés, it's not intended as parody. Nor is it unintentionally funny. But it is fun. Maybe I'm overly fond of The Dark because I first saw it in a theater during its initial release, having only recently turned old enough to sneak into R-rated horror. It was a grand time to attain that age, for horror was just beginning its slasher and Italian zombie cycles. Every week, the Midway theater devoted one of its four screens to a new horror double feature -- back then, horror filmdom was THAT prolific! I've since seen The Dark every few years, and have not yet tired of it. I view it not for a scary masterpiece, but out of warm nostalgia. You may enjoy it for the same reason -- even if you've never seen The Dark, you've seen its characters and character actors in dozens of other horror films.